Education Game News. Einstein's Riddle. P42 Release date 10.06.2016 year. On focus a new Planeta 42 free knowledge level test in Logic category. 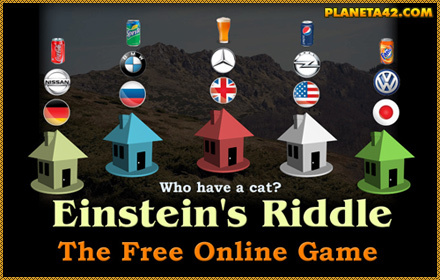 Einstein's Riddle is another visual solution for the famous Zebra Puzzle. Drag and drop the inhabitants and their hobbies in the 5 houses. New free online flash game.